DT-06 Module is based on ESP8285 ESP M2 module and provides easy to use WIFI to any UART Serial port and is pin compatible to HC-06 Bluetooth modules. If a project already uses Bluetooth then you can very easily convert into Wifi without any change in code. Using the built-in web interface transparent WIFI-UART communcation can be setup for TCP or UDP sockets on any port. This module requires NO configuration to get started! This module powers up as a standalone AccessPoint at DOIT_WIFI_XXXX with an IP address of 192.168.4.1. Any message sent to 192.168.4.1 on port TCP 9000 will be sent to TX/RX @ 9600bps and vice-versa. Connect module to Arduino or TX/RX of USB to Serial adapter. Connect phone or PC via Wifi to AccessPoint (SSID will show up as DOIT_WIFI_XXXX or something similar -- no password). Use a TCP Terminal or your own applications to send and receive messages to and from 192.168.4.1 on port TCP 9000. Fully compatible with the original electrical interface and physical interface for the serial transparent Bluetooth. Built-in the industrial transparent transmission firmware V3.0 with stability and reliability by using the Web Configuration. Built-in the high performance WiFi module ESP-M2 with size: 34mm*17mm*4mm. Working voltage: 4.5V~6.0V, TTL working voltage: 3.3V (compatible with 5.0V). Provided pins: STATE, TXD, RXD,EN. Average current: 80mA; when data sent, it is 170mA; but it is 20μA at deep sleep mode. Support re-programmable, OTA firmware update. Seamless transparent transmission between serial and WiFi. Built-in HTTP Web Server, support configure parameters by web page. Support re-connect automatically at WiFi STA mode and TCP Client. Support set baud rate, data bit, parity check, stop bits, and/or subcontracting time. Support baud rate (bps) 300, 600, 1200, 2400, 4800, 9600, 19200, 38400, 57600, 74800, 115200, 230400, 460800, 921600, 1843200, 3686400. Support AP enable, self-defined SSID/password, self-defined IP and network duration. Automatically scan the peripheral WiFi hotspot, support STA enable,DHCP, self-defined IP. Support TCP Server, TCP Client, UDP Server, UDP Client and UDP local broadcast. Support DNS resolution automatically for the remote sever address. Support checking the status by AT commanD. Provide IO4 to show the WiFi status. smart home, wireless data connection and transparent transmission, smart car control, wireless serial printer, LED light industrial control etc. 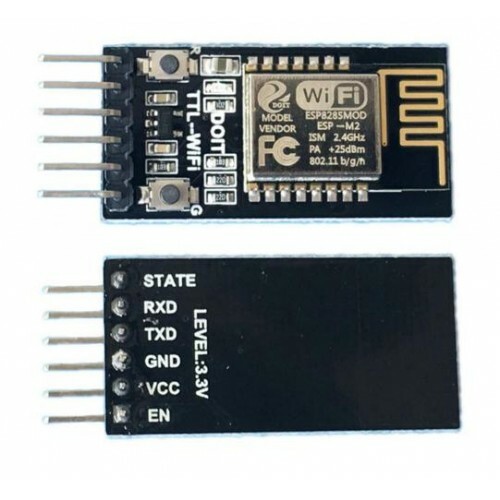 ESP-12S WiFi Module (ESP8266-12S)This ESP-12S WiFi module has core processor ESP8266 in smaller size..